First, credit where credit's due. 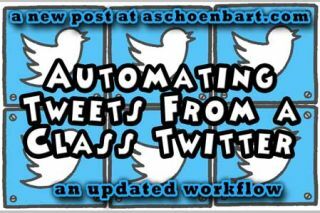 In this post, you will find my workflow for creating an automated Tweeting process that allows students to submit Tweets via Google Forms and have them automatically moderated and Tweeted through a class Twitter account. While I certainly didn’t invent this idea or process, I did update the workflow to add some power to the automation based on some blog posts and great ideas from other valuable sources. Jump to the bottom of this post for Episode 2 of the SchoenCast, which walks you through the process, if you want to get right down to it. John’s blog above basically sums up the whole first part of my process. I don’t want to be the guy who mentions complex ideas and doesn’t explain them but you can find so much at his site, along with some of my recent posts on add-ons or tools that help this process work. The basics of Form Mule and If This Then That and how they are used for this project are detailed on the Schoenblog at The SchoenCast Episode 01: Form Mule and How to Automate Blogging Workflow with #IFTTT. As usual, it all starts with a form. This one is simple, and can be found on my class website. A copy viewable to the public can be found at Tweet Me! Public. Notice the directions: The student name and class hashtag will automatically be added to the Tweet. The Tweet paragraph text box uses data validation, found in the advanced options, to limit the characters so that Tweet can never be too long. All of this can easily be customized in your form to meet your needs. Most similar workflows I’ve seen then require the teacher to open the Google Sheet form results and enter some sort of manual trigger for Form Mule to send the e-mail that triggers the #IFTTT recipe. Still with me? Good. The Pre-Filled URL referenced above is actually a link to a new form. Visit Alice Keeler’s post linked at the start of this article for more about pre-filled forms. With a Pre-Filled URL that looks like the line below, the link actually connects to a new Google Form for approval. If Revise is selected, the student is e-mailed to ask them to revise their Tweet. This addition might not add any crazy functionality but I think that using Forms only makes the process so much cleaner. John’s ideas work beautifully, and combining them with the Pre-Filled Forms makes this really powerful. Plus, with some simple additions to the forms and functions, it can be adapted to meet the needs of multiple teachers. By selecting a teacher or class period, the form can work to automate Tweets to different accounts or with different hashtags. I hope this walk though was helpful--and I hope it made sense. Most of my high school students are on Twitter but I’m finding this project incredibly useful for those who are not, not allowed to be, or are too young to Tweet on their own. As the teacher, I still have control, but the automation is simple, quick, and clean. To prove it, I made this quick screencast below. A second episode of the SchoenCast wasn’t my plan here, but it felt like a video explanation was needed. Let me know how it goes.